Toyota Matrix Repair & Service - A+ Japanese Auto Repair, Inc.
At our facility, A+ Japanese Auto Repair Inc, we have Toyota repair & service experts standing by to help with any questions or any Toyota repair and service needs you may have with your vehicle. Our facility has been working on the Toyota Matrix since it was released in 2003. Feel free to contact us with any Toyota auto repair & service questions you may have. The Toyota Matrix was initially rolled out as the Toyota Corolla Matrix. The Toyota Matrix was designed as a compact hatchback version of the Toyota Corolla sedan and soon took on a life of its own. Between 2003 – 2008 The Toyota Matrix first generation took off with the standard model and the XR model. We still see many of the first generation Toyota Matrix vehicles in our facility including the M-theory edition. The M-Theory was released in 2007 only. The M-theory edition was released in “speedway blue”, equipped with larger 17inch rims, upgraded exhaust and a sport tuned suspension. The second generation Toyota Matrix is still being produced today. The XRS model was also introduced at this time but dropped in the model year 2011. Most recently the 2009 and 2010 model year Toyota Matrix vehicles were affected by a recall Toyota initiated regarding floor mat and accelerator pedal replacement. The Toyota Manufacturer should have contacted you if your vehicle was affected by this recall. If you have concerns about this recall released by Toyota contact Toyota Motor Company directly. Toyota Matrix and A+ Japanese Auto Repair Inc.
We are experts when it comes to Toyota Matrix Repair & Service. We started working on Toyota Matrix in 2004. 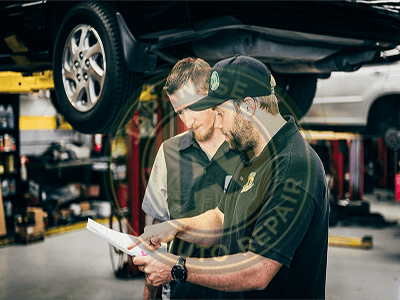 With numerous years of repairing the Toyota Matrix we are now known as the best alternative to the dealer for Toyota Matrix auto repair and service. A+ Japanese Auto Repair uses ASE Master Certified Auto Repair Mechanics and the same high quality parts as the dealership. We perform these auto repairs and services at a far better price than the dealership. We also offer a 24 month / 24,000 mile warranty on all auto repair and service performed on your Toyota Matrix.